Best Doctors provides access to a group of world­-class physicians who help patients to understand their medical condition and treatment options. 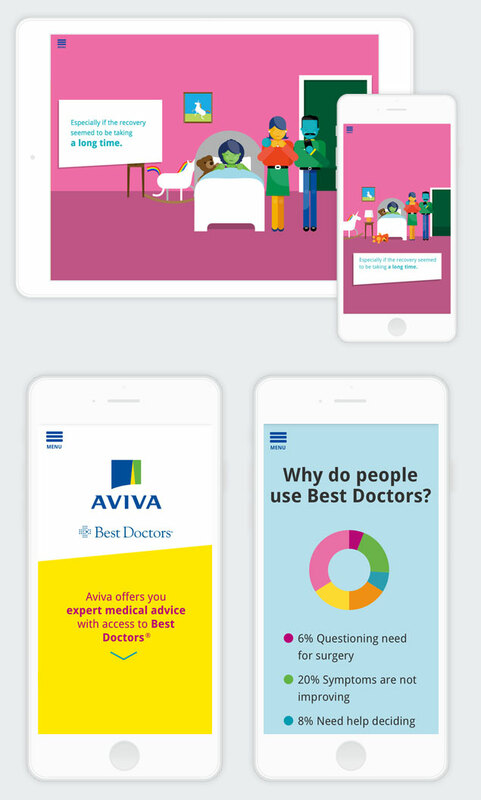 Aviva offers the Best Doctors service to their life insurance customers. They asked Xwerx to create a microsite that would communicate the concept to two distinct user groups. 2. Busy customers who don’t have time to digest a large amount of information. The biggest challenge was to present the benefits of Best Doctors in a way that would attract the interest of our time-­poor, “customer” persona. We had to find a creative way to capture the essence of the service. At the same time, we had to allow brokers to feel comfortable using the microsite as part of their pre­sales process. The solution had to transform gracefully across all devices. Working in close collaboration with Aviva and a panel of brokers, we combined modern web technologies with a traditional story telling device to deliver a solution. We leveraged the benefits of page scrolling to create a microsite that tells a simple story through a series of overlapping HTML5 canvas layers. These layers are animated as the user scrolls through the page. Text was stripped to the minimum so that the concept can be conveyed within 30 seconds. The illustrations adapt to the message as the user scrolls, generating a playfulness that encourages the user to reach the bottom of the page. The microsite has proved to be a key tool in Aviva’s drive to convert more customers to their life insurance offering.